At the heart of its “Les Classiques” Collection, Confrérie Horlogère upmarket watch brand has placed a Tourbillon wristwatch featuring a chronograph whose column wheel couples directly with the flying tourbillon carriage. This rare and precious timepiece comes with a hand-wound mechanical movement fitted with a flying tourbillon, i.e. with suspended carriage, at 6 o’clock. 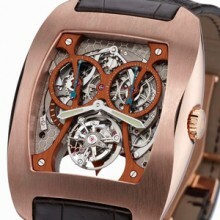 Its design is such that the carriage rotates without ball bearings and includes a Swiss lever escapement. A 72° sectoral indicator displays its 5-day power reserve. The column-wheel chronograph visible at 12 o’clock displays the seconds on a counter at 1.30 on the dial and the minutes on another, positioned at 10.30. The chronograph is actioned by the same push-piece: start, stop and return to zero are all effected by the push-piece at 3h. on the case. The upper and lower bridges and bars are made of a special aluminium, allowing the movement to take on any colour the customer might wish. The mainplate displays an original honeycomb decorative finish visible both on the dial side and through the sapphire crystal case back. Beating at 21’600 v.p.h., the heart of the watch is housed in an ergonomically designed tonneau-shaped case. 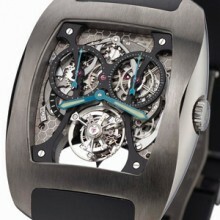 It is fashioned in one size only but comes in three versions: titanium, white gold and pink gold. Those who fancy the colour black may opt for a black PVD-finished version. The design’s spherical sapphire crystal further underscores the designer’s intention to create a smoothly sensual and ergonomic timepiece. Cut from extremely supple rubber or in the finest leather and both featuring titanium inserts, the strap comes fitted with a deployment clasp made in the same metal as the case, forming Confrérie Horlogère’s initials, the letters CH. The lifetime warranty and totally Swiss-made provenance constitute signature features of this and of all Confrérie Horlogère productions. > Movement : Mechanical movement with tourbillon-type Swiss lever escapement. Hand winding. Standard analogue display of hours and minutes at centre. Built-into this basic. > Dimensions of the movement : Movement shape: tonneau. Width 30.40 mm. Length 32.90 mm. Thickness 7.40 mm. > Power reserve : 120 h.
> Frequency : 21’600 v.p.h.